A central assumption in macroscopic thermodynamics is the weak coupling approximation, which posits that the equilibrium properties of a system are not influenced by the interactions with its surrounding environment. However, for nanoscale systems, interactions appearing in the total Hamiltonian may be comparable in magnitude to the systems own internal energy. The presence of non-negligible interactions can alter the system’s equilibrium state, causing deviations from the standard Gibbs distribution. This motivates alternative statistical mechanical definitions of the thermodynamic potentials, such as the free energy and entropy, which can be achieved through an identification of the system’s Hamiltonian of mean force. This operator provides an effective thermodynamic description of the system both in and away from equilibrium, taking into account the strength of coupling with the environment. 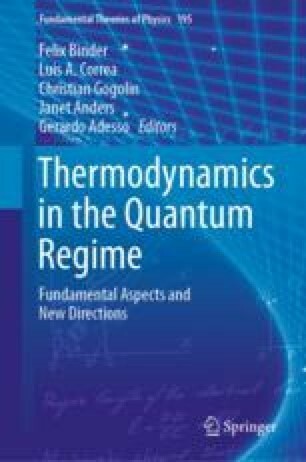 Here we give an overview of the properties of this operator, and demonstrate its usefulness in extending thermodynamics to the strong-coupling regime in both quantum and classical systems.